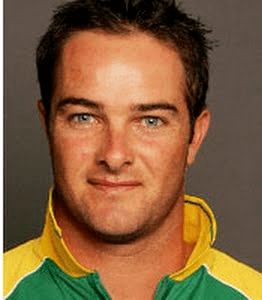 Mark Verdon Boucher (born 3 December 1976) is a former South African cricketer, who holds the record for the most Test dismissals by a wicket-keeper. He has represented Border, South Africa, Africa XI, ICC World XI and Royal Challengers Bangalore and Kolkata Knight Riders in the Indian Premier League. 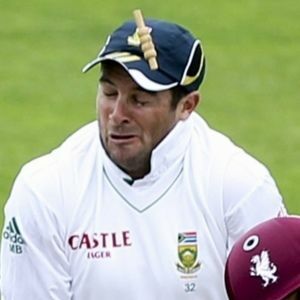 He had been a regular feature of the South African side since the 1997/1998 tour to Australia, until his retirement from international cricket in July 2012 after a serious eye injury against Somerset. Born in East London, Boucher was educated at Selborne College where he was coached by Richard Pybus. From the time he replaced Dave Richardson until his retirement, Boucher was South Africa's first-choice wicketkeeper, and is widely regarded as one of, if not, the greatest wicketkeepers South Africa has ever had. He holds the record for the most dismissals (catches and stumpings) in Test cricket. He reached the record originally when he overtook the former Australian wicketkeeper Ian Healy in the first test of the Bank Alfalah Test Series versus Pakistan in Karachi on 3 October 2007 when he stumped Umar Gul off the bowling of Paul Harris. He then lost the record to Adam Gilchrist before regaining it when he caught Mushfiqur Rahim of Bangladesh in February 2008. 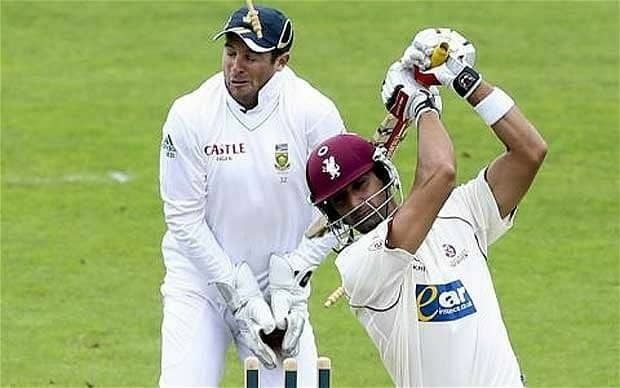 Boucher is also second on the all-time list in One Day Internationals, also behind Adam Gilchrist. He once held the record for the highest score by a nightwatchman in Test cricket with 125 for South Africa v Zimbabwe at Harare in November 1999. On 12 March 2006 he hit the winning runs for South Africa against Australia in what had been the Greatest One Day International ever played. Later in 2006, on 20 September, he made his maiden ODI century, hitting an unbeaten 147 against Zimbabwe from a mere 68 balls. His hundred came up off just 44 balls, the second-fastest ODI century ever by a South African after AB de Villiers. Boucher did benefit, however, from some very poor Zimbabwean fielding, being dropped no fewer than six times during his innings. He has played over one hundred consecutive ODIs for his country and is one of only eleven players, including Hansie Cronjé and Shaun Pollock, to achieve this. In February 2007 he and Jacques Kallis combined to hit Mohammad Asif for 28 runs off an over in an ODI at SuperSport Park in Centurion. It broke the South African record for most runs off an over which was previously held by both Shaun Pollock and Graeme Smith with 27. However, this was later broken by Herschelle Gibbs with 36 runs off one over, the most possible without no-balls or wides. In the period while the team was under Shaun Pollock's leadership, Boucher was the regular vice-captain of the team and lead the team in tests four times. These matches include a victory over Australia, an achievement which Pollock could not manage. Boucher started his 2007 World Cup campaign in good form with a 21-ball half century, the then fastest in World Cup history (before being beaten by Brendon McCullum's 20-ball effort six days later) – scoring 75 not out against the Netherlands as South Africa scored 353 for 4 wickets in a rain-shortened World Cup match. However, this was overshadowed by Herschelle Gibbs's six sixes in an over, the 3rd time ever in world cricket and first time in a One Day International match, and thus in the World Cup. He became the first wicketkeeper in the history of test cricket to reach the milestone of 400 dismissals when he caught Danish Kaneria off the bowling of Makhaya Ntini on 10 October 2007 in the second test of the Bank Alfalah Test Series against Pakistan at Gaddafi Stadium, Lahore. 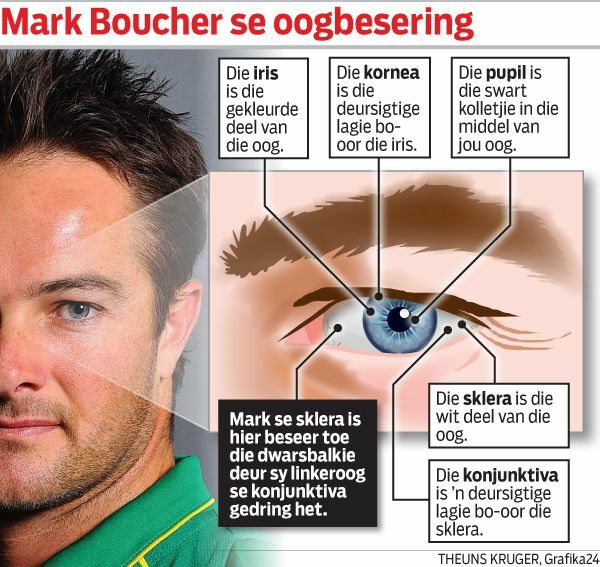 Mark Boucher suffered a serious eye injury on 9 July 2012, after being struck on his left eye by a bail. He was not wearing a protective helmet nor glasses when he was struck by the bail after leg-spinner Imran Tahir bowled Somerset's Gemaal Hussain. Following surgery to the eyeball, Boucher was ruled out of the rest of the tour. 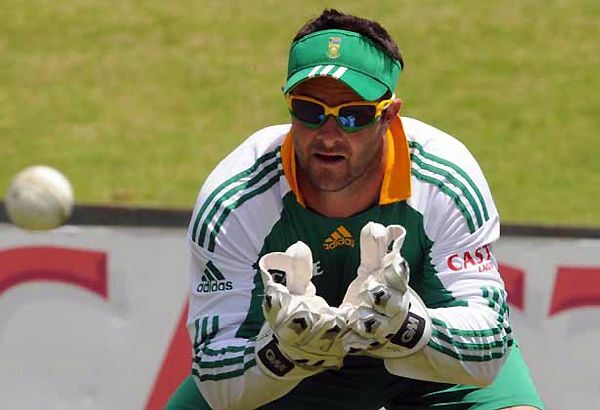 Due to the severity of the injury, Boucher—who had planned to retire at the end of the tour—retired from International Cricket on 10 July. There was no damage to the retina, so it was felt that there was a chance for Boucher to recover some vision in the damaged eye. After undergoing two operations on his injured eye, surgeons announced that they were "cautiously optimistic". Tributes included comments from Shaun Pollock and Kevin Pietersen. Pollock congratulated him on a great career, while Pietersen called for more support from fans and those involved in sports, saying "Let’s keep it going! Bouch is a fighter!". In May 2017, he was named Coach of the Year at Cricket South Africa's annual awards.